"We absolutely loved our stay in eOCambo Village!" Have a question for eOCambo Village? "The cleanliness, the design, the service staff were all top notch for the value we are paying." "My family and I were really happy to stay here." Whether you're a tourist or traveling on business, Golden Village Guesthouse is a great choice for accommodation when visiting Siem Reap. Situated only 1 km from the city center, guests are well located to enjoy the town's attractions and activities. With its convenient location, the hotel offers easy access to the city's must-see destinations. 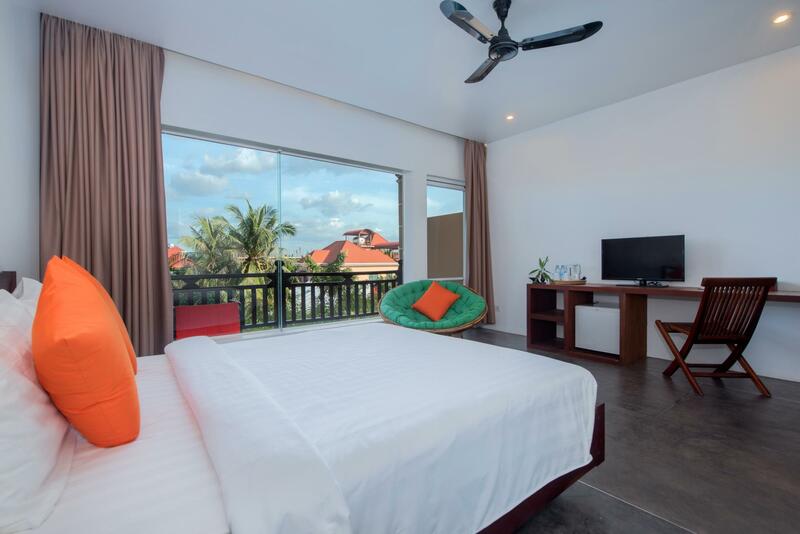 Golden Village Guesthouse also offers many facilities to enrich your stay in Siem Reap. The hotel provides free Wi-Fi in all rooms, 24-hour security, convenience store, daily housekeeping, fireplace to ensure our guests the greatest comfort. Golden Village Guesthouse is home to 29 bedrooms. All are tastefully furnished and many even provide such comforts as television LCD/plasma screen, additional toilet, cleaning products, clothes rack, complimentary instant coffee. 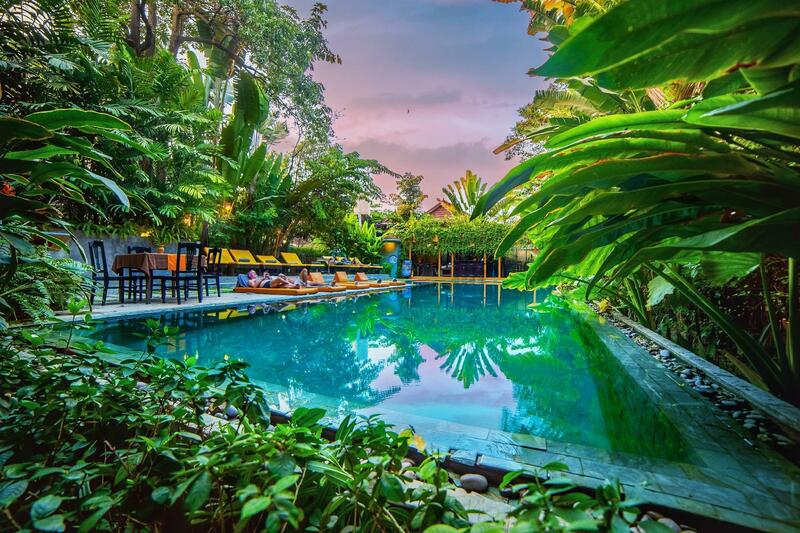 Whether you're a fitness enthusiast or are just looking for a way to unwind after a hard day, you will be entertained by top-class recreational facilities such as boats, outdoor pool, massage, pool (kids), garden. 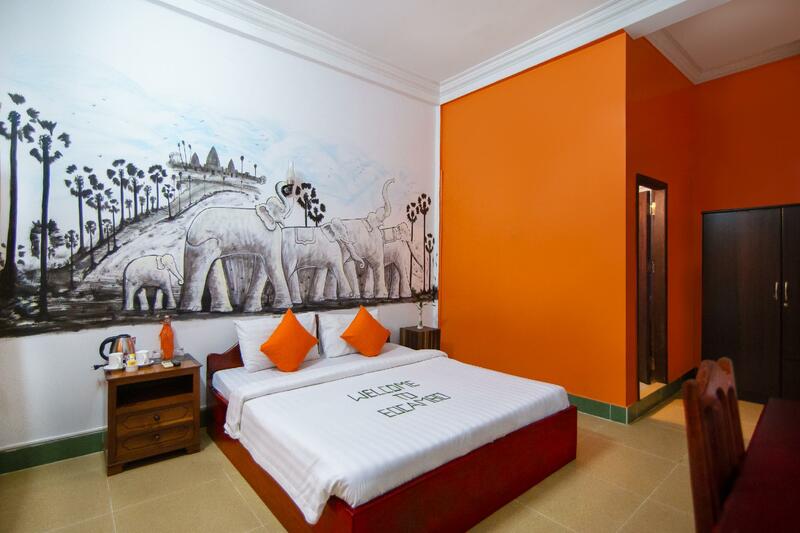 Golden Village Guesthouse is your one-stop destination for quality hotel accommodations in Siem Reap. "I really enjoy my stay there and highly recommend this hotel..."
We thoroughly enjoyed our stay! The staff were all so friendly and helpful. Ratey and her reception staff took care of all the details organizing our time in Siem Reap and it was a joy to return each day to the beautiful swimming pool. The included buffet breakfast was greatly appreciated also. We highly recommend the e Ocambo. Staff and service is amazing and we couldn't ask more since they provided everything to us during our stay. Our trip to Siem Reap was wonderful because the hotel made sure that everything is arranged. We will definitely recommend this hotel. Thank you! We stayed at the eOcambo village for 4 nights in early February. The hotel is a bit out of the way but Tuk Tuks are easy to arrange and are reasonably priced. The hotel staff is accommodating and welcome you home after a long day of touring. The hotel pool is quite refreshing and the breakfast buffet was a delight. Thoroughly enjoyed our stay. Communicating with the staff was extremely easy. Our breakfast was enjoyable every day and the tours we booked were fantastic. Room was spacious and very clean and everyone was very happy to ensure our stay was comfortable. The rooms are spacious, clean and very well maintained. The breakfast spread was vast and tasty. The staff were very friendly and took very good care of us. The kids were given extra care and attention by the staff. Staff were very welcoming. Rooms were great - comfortable, clean, and air-con quiet. Breakfast choice was some of the best I've seen anywhere, and tasty. Bar staff know how to make a good cocktail! Tuk Tuks are readily available outside. I had a lovely time at eOcambo and I loved Siam Reap also because of this place. The room was big and clean and the pool really amazing after a day of sightseeing. The breakfast very filling and tasty and the staff very young and attentive. A special thanks to Ratey for being so sweet and telling me a lot about this beautiful country. We booked online. Arrived late and they told us they had overbooked and wanted to send us to another hotel which was not as beautiful. We got a good price and i am sure that they had walk ins and offered the hotel big money as it was Chinese new year. Very unhappy that they did this to us so late. 25 minutes tuk tuk from the airport. Clean. Staff are all very helpful. 2USD tuk tuk ride from pub street. They can arrange tours with a local firm very efficiently. Room was clean and serviced every day. Top marks. I really enjoyed our stay at eOcambo Village. The hotel is nice, stylish and very well designed. The rooms are very large, with good finishings, great bathroom, tasteful decorations - all giving a modern but also cosy feeling. The pool is great too. The hotel is in a quiet and green part of town, which is very pleasant and relaxing, but it is also only a very short walk to restaurants. The busy pub street is walking distance too. If someone is not a big fan of walking, the hotel staff helps to get a tuktuk for a fair price. Most importantly, the service was really amazing! We felt so welcome and all our questions or wishes were always answered in a professional and friendly way. Hotel staff helped us to buy some local goods directly from the producers and on our last day, after we had forgotten something in our room, they rushed to the bus station to give it to us, just before our departure. We were really grateful for their help. The staff is absolutely fantastic and professional. We had a room with balcony on 3rd floor - spacious, great decor. Good breakfast and great swimming pool to relax by. Restaurant good for evening meals. Location good - 10 min walk to Pub Street or $1 tuk tuk ride. Staff helpful. Thu the Yuk Yuk driver is very good for transport. If you're looking at this hotel and and trying to decide I'm here to tell you to book it immediately!! This one of our favorite places we stayed during our 6 week trek through SE Asia. The hotel itself it beautiful, the pool is amazing (and much needed in the heat! ), the rooms are clean, spacious, and have great AC, the location is perfect, the food is amazing, but most of the THE STAFF!!!! The absolute best hotel staff I've ever encountered. Specifically, Kitt and Pisean made our trip unforgettable. They were so incredibly helpful and kind. They truly cared that we enjoyed ourselves and made sure to do everything they could to ensure a pleasant stay. After leaving we've been recommending this place to every traveller we talk to that's planning to be in Siem Reap and can't wait to go back ourselves. Thank you to everyone at EoCambo for such a wonderful stay! The staff were extremely helpful. They went the extra mile to make us feel valued customers. They arranged for all the tours in tuktuk and were always willing to help in getting any information we inquired for. The breakfast was good. The hotel upgraded our room to Deluxe King size bed without any charge so that it was comfortable with my son. Also provided for free pick up and drop to airport. Nothing more to ask for. Overall a great experience! Great accommodation, very friendly and helpful staff that can assist you to book tours / activities etc, And amazing location, within 4-5 minutes walk from the main streets. I’ve actually extended my stay here and still staying one more night, Will definitely come back! Thanks everyone for a wonderful stay! The staff is amazing always smiling , so helpful , amazing people .The hotel is in a very good location quiet place with only 10 minutes walk to the center or two dollars with tuk tuk which you can found at the door of the hotel . Breakfast is amazing with many options to take . Amazing swimming pool . The only one thing we weren't happy it was the room , we got a room with a very old and uncomfortable mattress . But I do recommend this hotel very much . Everything! The hotel is set is lovely grounds, the staff from the minute you walk in the door are welcoming and friendly - the literally can’t do enough for you. 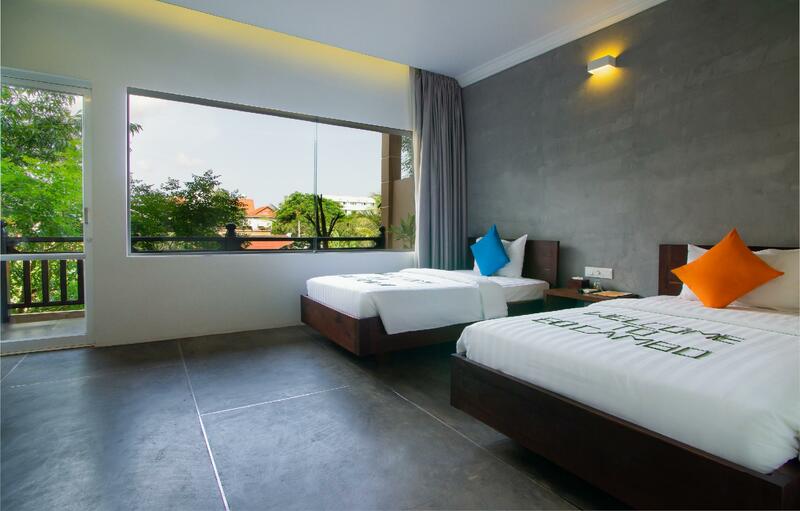 The rooms are large and modern with comfy beds (Deluxe Room). The hotel is down a slight lane however we felt very safe walking this in the dark and if you don’t want to walk only $2 in a tuk tuk. We also booked Angkor wat tuk tuk tour through the hotel - Mr Heoun is a delight, so friendly and made our tour so much more enjoyable! Also the massage is wonderful after a full day of walking round Angkor wat. I would recommend this hotel to anyone and can’t wait to return!